Find this beer and more at Full Throttle Bottles in Georgetown. Intro: What’s this? A new beer from Guinness!? Well, kind of. 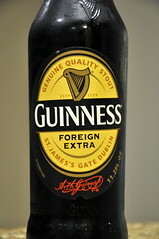 The Guinness Foreign Extra Stout has been available in several international markets for quite a while. It was even available in the US prior to prohibition, but it never returned afterward…until now. What might surprise you is that while it is just making its return to the US, it actually accounts for 45% of Guinness sales globally. It’s the bigger, badder brother of the “original” Guinness that you all know and love. Description: Pours a very dark brown with a big frothy head. It’s obviously missing that trademark nitro action of the original Guinness, but it’s a nice looking beer regardless. Sweet caramel malt and molasses aroma. Taste is sweet dark malts with caramel and medium roast. A little bit of smoke comes through as well. It finishes with a significant bitterness that really sets it apart from the original. Full bodied, yet not too heavy. Overall, it’s a very nice, drinkable stout. It’s not complicated, and it remains smooth as can be at 7.5%. I’d gladly take one of these anytime. GUINNESS® Irish Stout announced today the U.S. launch of GUINNESS® Foreign Extra Stout, the fullest in flavor of the GUINNESS brand variants. Deep brown in appearance, GUINNESS Foreign Extra Stout is carbonated unlike the nitrogenated GUINNESS Draught with which most Americans are familiar. The specialty beer is 7.5% ABV and possesses strong, roasted aromas followed by a unique bittersweet taste that beer aficionados can enjoy responsibly. The history of GUINNESS Foreign Extra Stout involves a long brewing tradition of crafting great GUINNESS beer as well as the rich history of Guinness global exports. GUINNESS Foreign Extra Stout dates back to 1801, when it was first brewed at St. James’s Gate brewery in Dublin. Originally known as West India Porter, it was developed to enable GUINNESS to be shipped around the world. In order to accomplish this, it was brewed with extra hops, giving the beer a more intense flavor. The extra hops also acts as a natural preservative for beer, allowing it to survive long journeys overseas. GUINNESS Foreign Extra Stout made its debut in the U.S. in 1817. Export to the U.S. was discontinued during prohibition and the variant is now making its return to the market. GUINNESS Foreign Extra Stout is brewed at a higher hop rate than GUINNESS Draught and its fullness of flavor and character have remained unchanged. Known for its unique taste, GUINNESS Foreign Extra Stout has an initial effervescent impact leading to a dry finish and a full bodied palate of roast character. It is produced using four basic ingredients: grain, water, hops and yeast. Yeast from each brew is transferred on to the next, so the original yeast’s descendants are still in the GUINNESS Foreign Extra Stout we drink today. The carbonated stout should be served in a branded GUINNESS goblet, but can also be enjoyed chilled straight from the bottle. To enjoy the perfect goblet of GUINNESS Foreign Extra Stout it requires a one-part pour at a 45-degree angle and a five step ritual: Chill, Release, Pour, Toast, and Enjoy Responsibly. GUINNESS and its parent company Diageo, the industry leader in social responsibility advocacy, implore responsible consumption of GUINNESS Foreign Extra Stout just as they do with each of the GUINNESS offerings. A favorite of many around the world, GUINNESS Foreign Extra Stout makes up 45% of GUINNESS sales globally. GUINNESS Foreign Extra Stout will be found in retailers that sell specialty beer in October 2010 with a suggested retail price of $9.49 for a 4-pack. Please visit www.GUINNESS.com to learn more and remember to always drink responsibly. Interesting. I drank a lot of this stuff when I lived down in the Caribbean in the early 90’s. I’d be interested to see if this is much different than what I remember. My recollection is of a sickly sweet, burnt malt flavor with a hint of medicinal bitters – not unlike Malta Goya/India. I preferred Dragon Stout from DG in Jamaica to the FES, although the styles were similar.